Hands in Pasta is an Italian restaurant in Hammersmith that comes with a twist. No, that doesn't just mean the pasta is served fusilli-style, it means that the family-friendly restaurant is dedicated to keeping your little-ones happy and entertained. As you turn the corner from King Street, a lovely yellow-painted front resembling a fairytale castle awaits you. The fairyland theme continues inside, and as you head up the winding staircase the children are greeted to this magical view. Yes that's right, a whole section of the first floor is a kids' area (leaving the downstairs a quieter space for adult-only diners), so once the children have finished their food, they can happily play while the grown-ups finish their meal in peace. The menu is classic Italian and all reasonably priced, with pizzas, pasta dishes, salads, grilled meat and fish all available. 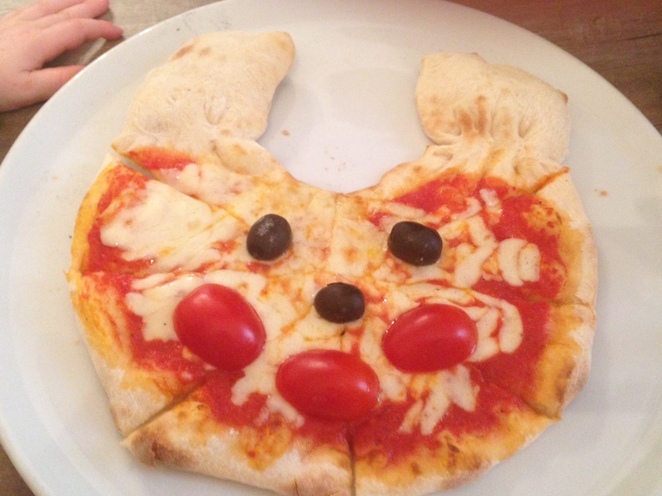 Children have their own special menu which includes this Margherita bear-shaped pizza for £4.95 (this went down very well with our three-year-old when we visited recently). 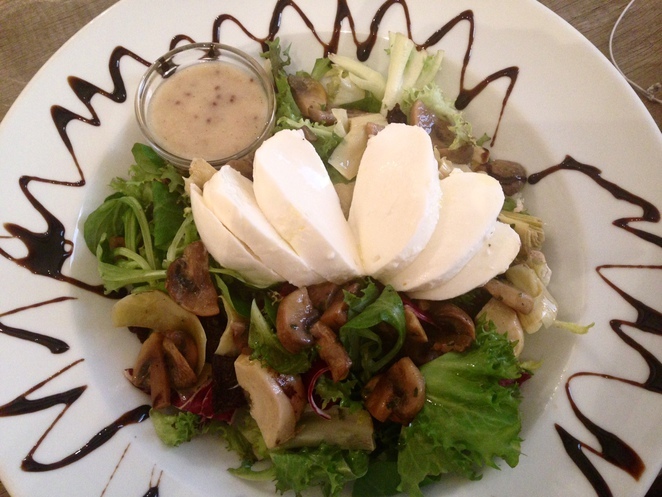 I opted for this warm mushroom salad (insalata funghi) priced at £9.95, which was delicious. The other adults in our group went for Penne Gorgonzola priced at £10.50, Vegetariana pizza for £9.20 and Margherita pizza for just £6.95. All looked delicious, and needless to say all of our plates were emptied. There's an extensive drinks menu too with choices including cocktails, prosecco, sweet, red or white wine, and a selection of soft drinks and hot drinks. Dessert options include Tiramisu for £4.95 and Italian cheesecake for £4.90. Our daughter enjoyed a 'Magic Toy' ice cream for £4.20; the dessert arrived in a specially designed toy animal. 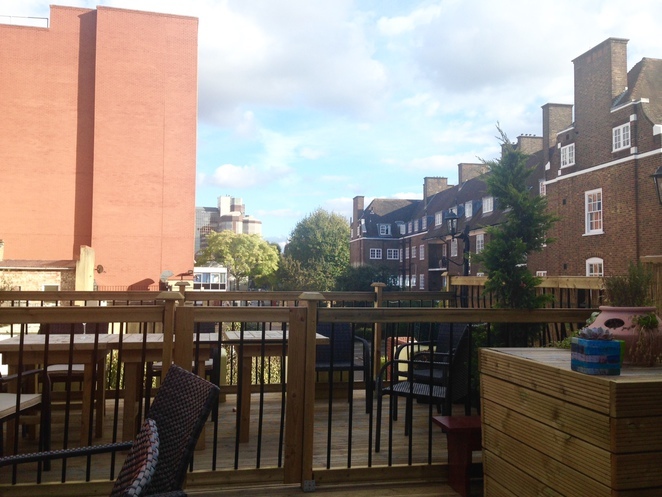 Also upstairs, there is a door leading out to a fantastic decked roof terrace, where you can look out over the rooftops and sit and enjoy food and drink on a sunny day. And perhaps the pièce de résistance in the restaurant's attempt at being child-friendly is the toilets, where little and large can sit on the throne at the same time! We visited Hands in Pasta on a chaotic Saturday lunch time, and although I found the staff to be a little overwhelmed by the busy restaurant, I thought the food was yummy and arrived on time. I think the concept of the restaurant is great and would recommend it for families with young children. I imagine it is a great place for a reasonably priced evening meal too. 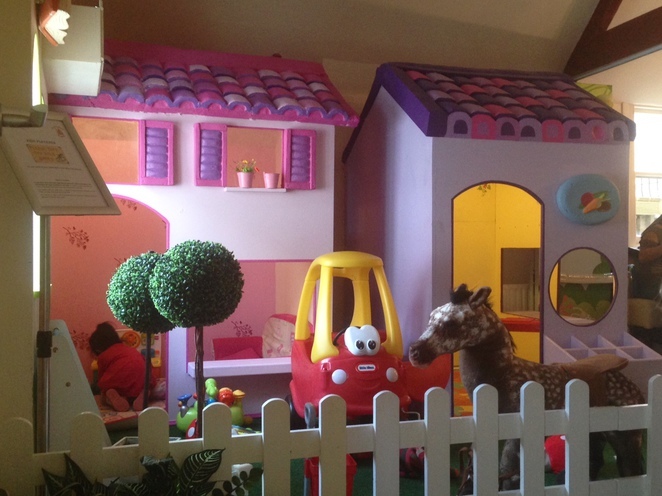 The restaurant also offers private hire, kids' parties, and many other child-focussed activities during the week such as stay & play sessions, classes and an interactive theatre. For more information about all this, to see their menus and to make a reservation visit the website. They are also on Facebook and Twitter too. Hands in pasta is located at 2 Holcombe St. The nearest Underground station is Hammersmith, which is served by the Piccadilly, District and Hammersmith & City lines, as well as many bus routes.